OneNote is one of the best applications Microsoft has developed in recent years. With yesterday's update of the OneNote Windows Store app, it just got better, with the ability to capture notes using the Share charm and scan physical documents with your device's camera. 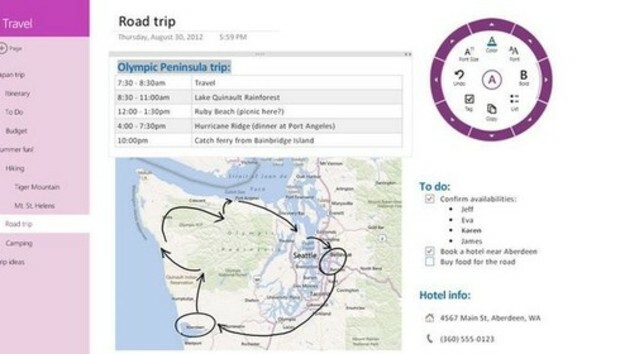 OneNote now lets you capture virtually any Windows 8 screen. If you find a website you want to make note of or a recipe you want to save for later, just swipe from the right to open the Charms bar, and and use the Share charm to send it to OneNote across all your devices. You can save it as a part of the currently open page or as a new one. You can also add a short annotation. With the app's new Camera Scan feature, you can photograph tough-to-capture documents like magazine pages or a meeting whiteboard. Camera Scan automatically crops, rotates, straightens, removes shadows, and sharpens the image to make it look more like a scanned document. Camera Scan also includes OCR (Optical Character Recognition), which converts the words in a recipe, receipt or other hard copy document into searchable text. You can also copy and paste the text into other OneNote notes or into the Windows clipboard to be used elsewhere. One of the nice things about these new features is how well they integrate with Windows 8 devices. Microsoft has had very little success using the Office suite as a carrot to lure users to adopt Windows 8 devices. This new Windows 8 OneNote app, however, may be more attractive bait. It's the best version of OneNote available, and it makes Windows 8 more powerful for those that already use it, and may help customers to consider a switch to a Windows 8 device after all.